Lock in a great price for Villa Small Paradise – rated 10 by recent guests! Located in Ialyssos Town, just 1.9 mi from the beach, Villa Small Paradise offers accommodations with a private pool and hot tub in the garden. Each fully equipped unit, as well as the garden, feature free WiFi. Set among a 2,000 m2, private garden, Small Paradise is an air-conditioned, 3-bedroom villa with a spacious living room offering a fireplace, dining area, TV and DVD player. There is also a spacious and fully equipped kitchen. It opens to a balcony facing the pool and the garden. 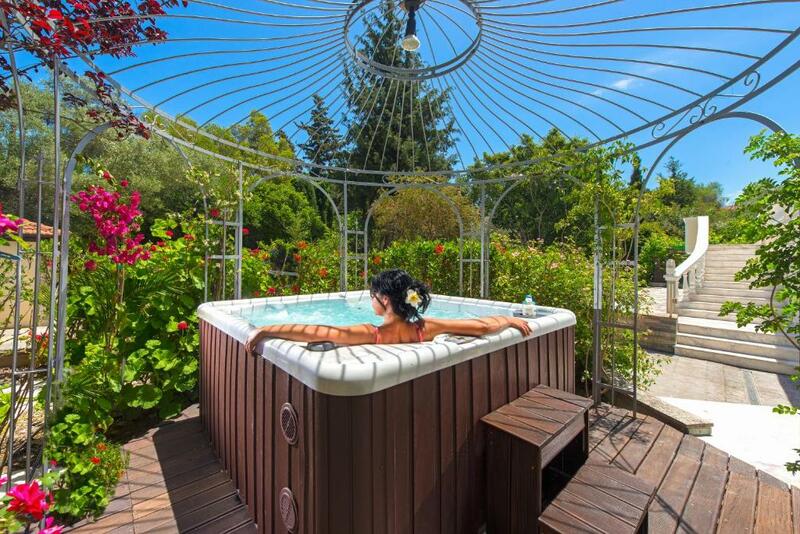 Guests may relax in the hot tub, at the sun loungers by the pool of Villa Small Paradise or prepare their meal at the stone built-in BBQ and enjoy it under the pergola. Fresh fruit and local wine are offered upon arrival. Rhodes International Airport, as well as the Old Town and the port are located 6.2 mi from the property. Free private parking is possible on site. 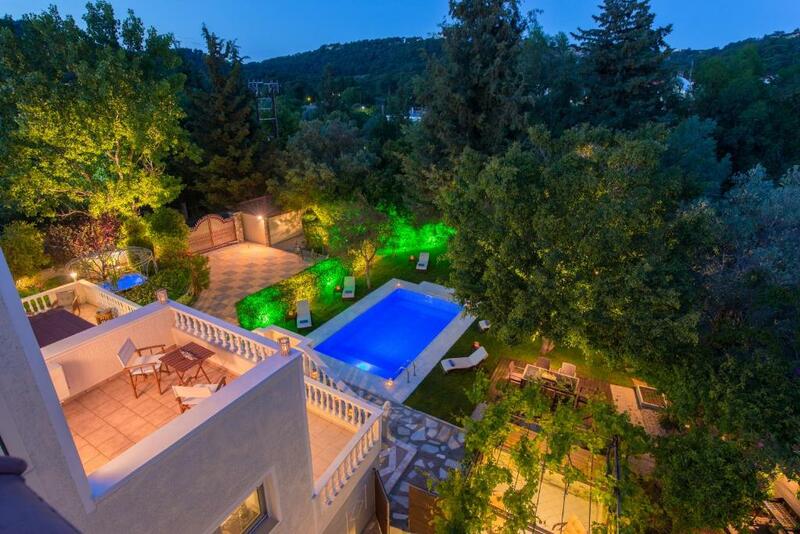 This property also has one of the top-rated locations in Ialysos! Guests are happier about it compared to other properties in the area. 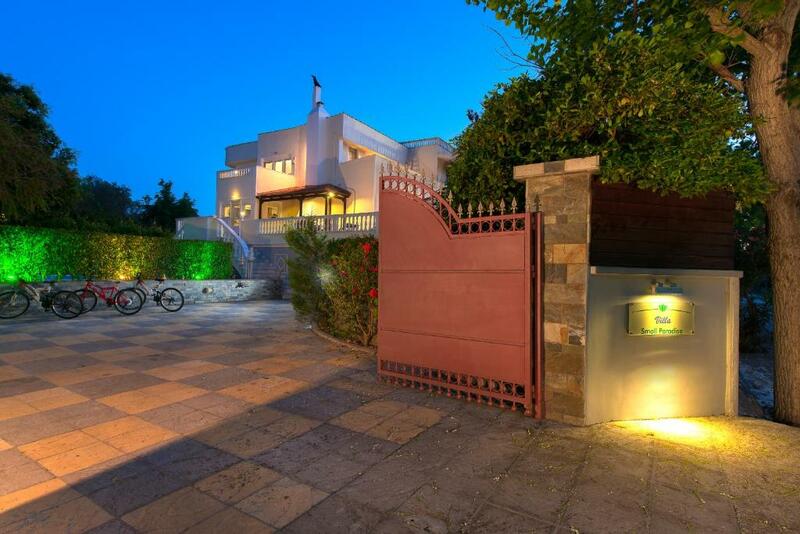 This property is also rated for the best value in Ialysos! Guests are getting more for their money when compared to other properties in this city. When would you like to stay at Villa Small Paradise? -pergola with stone, built-in BBQ and dining area. Welcome package with local souvenir, fresh fruit and local wine is offered upon arrival. Villa Small Paradise, provide visitors with unique moments of quality relaxation in an environment where elegance meets discreet luxury ,in complete privacy and away from prying eyes. My name is Maria and I am the owner of Villa Small Paradise ! I born in Athens and I grow up in beautiful Rhodes . I am working in tourism over 20 years ,as my job is Hotel Manager. I would be very happy to welcome you on my villa and assist you with in every way during your stay giving you all kind of information in relation to the Villa , the island arranging tickets, rent a car, excursions to places worth visiting etc. I enjoy meeting people from different countries and give them a local insight to my city . Be my guests and my friends!!! Villa Small Paradise, is located in the cosmopolitan island of Rhodes, in a peaceful spot, 3 km from the popular town of Ialyssos-Ixia (with a vibrant night life, restaurants, bars, café, banks, shops, mini-markets and other amenities, as well as, a wonderful organized sandy beach), 9 km from the famous Medieval Old Town of Rhodes, the Grand Masters Palace and the Port, and 10 Km from Rhodes International Airport, Diagoras. This privileged location, makes the Villa, the ideal starting point for effortless exploration of whole island’s beauties, beaches and tourist attractions. Villa Small Paradise, provide visitors with unique moments of quality relaxation in an environment where elegance meets discreet luxury. Incredible surroundings and views with an ambience of colors, as well as, the aroma of herbs and flowers of Rhodian nature, mixed with the prestigious architecture, enlist Small Paradise villa into the first category of the most majestic selection of villas in Rhodes. 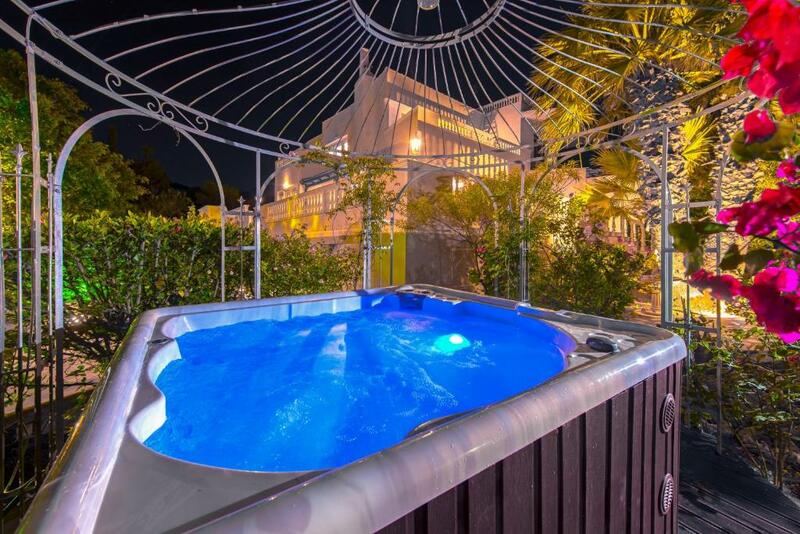 Villa Small Paradise, guarantees that your holidays in beautiful Rhodes will surely be an unforgettable experience leaving you only wishing to come back for more. House Rules Villa Small Paradise takes special requests – add in the next step! Please note that there are 3 bicycles available for free. Free cleaning service is also provided in the middle of your stay. At the backyard, in a separate area from the villa, there is a private apartment in completely discrete use of the owner. A baby cot can be provided for free. Villa Small Paradise also accepts PayPal as a method of payment. Please inform Villa Small Paradise of your expected arrival time in advance. You can use the Special Requests box when booking, or contact the property directly using the contact details in your confirmation. Amazing villa we had great time , we loved the garden with the pool and Jacuzzi really small paradise. The villa was very clean and full equipped with all we needed!! On arrival offered to us local wine and fruits. Maria the owner was very helpful and she gave us all the information about the island . Definitely we will come back next summer for more days!! We travelled for a bachelorette party - 7 girls. Its an amazing property very beautiful and comfortable. Villa is about 15 min drave from Rhodes city in a quite location. Maria was beyond ani expectations. She was helpfull and so kind. She made our stay even better. Helped with renting cars, shopping, recommendations, one of the girls left her charger and Maria offered to send it to us! Pool outside and jacuzzi are great and we spent alot of time there. For us it was just perfect and everyone said they will come back. It was a great time and wonderful place. 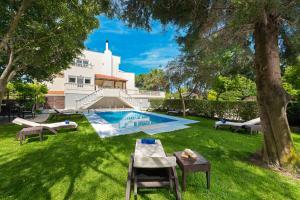 Villa is charming with very good location. Swimming pool and jakuzi, beautiful and romantic time to spend. Everything clean and tidy. Owner Maria was very helpful and kind. Great stay and wonderful holidays.